Pharmacological agents are being developed to modulate phospho-dependent cell signaling. Historically, our emphasis in this area has been on inhibitors of phosphotyrosyl (pTyr)-dependent binding interactions, which are mediated by src homology 2 (SH2) domains and on protein-tyrosine phosphatase (PTP) inhibitors. More recently, our efforts have focused on developing polo-like kinase 1 (Plk1) polo-box domain (PBD)-binding inhibitors. Central to all these efforts is the development phosphoamino acid surrogates that afford either increased stability toward enzymatic degradation, increased affinity or increased cellular uptake. 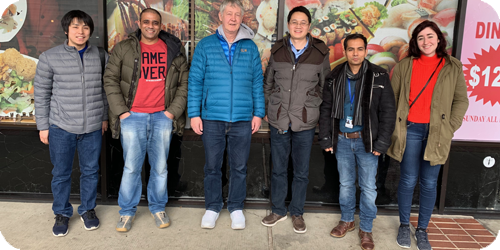 In the SH2 domain area, we have collaborated with Dr. Donald Bottaro (CCR, NCI) to develop cell-permeable growth factor receptor-bound 2 (Grb2) antagonists as potential new therapeutics for a variety of erbB-2- and MET-dependent cancers, including breast cancer. For this work, we designed peptidomimetics as conformationally constrained analogs of natural Grb2 SH2 domain-bound pTyr-containing peptides. In related research, a series of new pTyr-mimicking amino acid analogs were prepared to enhance cell permeability. In the phosphatase area, our recent efforts have concerned the development of inhibitors of the Yersinia pestis phosphatase, YopH, which is a PTP required for infectivity of this potential bioterrorism agent. This work is being conducted as a collaboration with Drs. David Waugh (CCR, NCI) and Robert Ulrich (USAMRIID). Here we have used an oxime library-based approach guided by X-ray co-crystal structures of our inhibitors bound to YopH. In the Plk1 area, we currently have a significant effort underway to develop Plk1 PBD-binding antagonists. This work is being done in collaboration with Dr. Kyung Lee (CCR, NCI). Starting from a pentamer phosphothreonine (pThr) peptide derived from a cognate Plk1 substrate, we are designing and synthesizing peptides and peptide mimetics that contain modified amino acid analogs. We have arrived at agents with extremely high PBD-binding affinity, that have the ability to block division of cancer cells in culture. The goal of this work is to achieve compounds that can exert potent anticancer effects in animal tumor models. In separate work, inhibitors of HIV integrase are being developed as potential anti-AIDS drugs. Lead inhibitor structures have initially been derived from several sources, including three-dimensional pharmacophore searching of the more than 250,000 compounds contained within the NCI's chemical repository. Promising compounds have been systematically explored through chemical synthesis of analogs to determine structure-activity relationships (SAR) responsible for integrase inhibition. Information generated in this fashion has been applied to the design and preparation of new analogs having higher potency, reduced collateral cytotoxicity, and greater antiviral protective effects in HIV-infected cells. In collaboration with Drs. Steve Hughes (CCR, NCI) and Yves Pommier (CCR, NCI) we have recently developed non-cytotoxic agents that exhibit anti-viral efficacies in cell culture models of HIV-1 infectivity that equal or exceed the potencies of current clinical IN inhibitors, while retaining greater efficacy against virus harboring major resistant mutant forms of IN. A third area of investigation concerns developing antibody-drug conjugates (ADCs) in collaboration with Dr. Christoph Rader, Scripps, Florida. This work is focused on designing and synthesizing new constructs for attaching drugs and targeting moieties to antibodies. This software can be downloaded free-of-charge from the Molsoft L.L.C. web site. 1) Métifiot M, Johnson BC, Kiselev E, Marler L, Zhao XZ, Burke TR, Marchand C, Hughes SH, Pommier Y.
Selectivity for strand-transfer over 3'-processing and susceptibility to clinical resistance of HIV-1 integrase inhibitors are driven by key enzyme-DNA interactions in the active site. 2) Hogan Megan, Bahta Medhanit, Tsuji Kohei, Nguyen Trung X, Cherry Scott, Lountos George T, Tropea Joseph E, Zhao Bryan M, Zhao Xue Zhi, Waugh David S, Burke Terrence R, Ulrich Robert G.
3) Smith Steven J, Zhao Xue Zhi, Burke Terrence R, Hughes Stephen H.
HIV-1 Integrase Inhibitors That Are Broadly Effective against Drug-Resistant Mutants. 4) Smith Steven J, Zhao Xue Zhi, Burke Terrence R, Hughes Stephen H.
Efficacies of Cabotegravir and Bictegravir against drug-resistant HIV-1 integrase mutants. 5) Boyer Paul L, Smith Steven J, Zhao Xue Zhi, Das Kalyan, Gruber Kevin, Arnold Eddy, Burke Terrence R, Hughes Stephen H.
Developing and Evaluating Inhibitors against the RNase H Active Site of HIV-1 Reverse Transcriptase. 1) Burke TR, Gao YR, Voight JR, Wei CR (submitted in 2000) Sh2 Domain Binding Inhibitors. Patents pending: 01964256.0 (EP application); PCT/US01/26078 (PC application); 60/226,671 (US application); 10/362,231 (US application); 2001285133 (AU application); 2419870 (CA application). 2) Burke TR, Gao YR, Yang DR, Yao ZR (submitted in 1999) Phenylalanine Derivatives. Patent pending: 2855415 (CA application). 3) Pommier Y, Burke T, Neamati N, Zhaiwai L (submitted in 1999) Hydrazide Inhibitors Of Hiv-1 Integrase. Patents pending: PCT/US00/06361 (PC application); 60/124,302 (US application). 4) Bottaro DP, Atabey NP, Breckenridge DP, Burke TP, Gao YP, Yao ZP (submitted in 1999) Inhibition Of Cell Motility And Angiogenesis. Patent pending: 60/221,525 (US application). 5) Bottaro DP, Atabey NP, Breckenridge DP, Burke TP, Gao YP, Yao ZP (submitted in 1999) Inhibition Of Cell Motility And Angiogenesis By Inhibitors Of The Grb2 Sh2-domain. Patents pending: 00992431.7 (ES application); 00992431.7 (FR application); 00992431.7 (GB application); 00992431.7 (IT application); 531405/2001 (JP application); 00992431.7 (CH application); 00992431.7 (DE application).